In order to market their upcoming sneakers, sportswear brands use several strategies and techniques that sometimes cost more than producing the sneakers themselves. In addition to exclusivity and innovation, sneaker creators very often than not, resort to collaborations as yet another way to build hype and desire around their upcoming drops. And despite their popularity as a business strategy in the sneaker community, not all collaborations leave a mark as big as the one made by the Nike x Off white extended collab. In the past couple of years, Virgil Abloh has gained unprecedented fame and recognition thanks to his fast-growing brand Off-white and his new position as the men’s artistic director at Louis Vuitton. However, it’s safe to say that his partnership with Nike was how many of his fans have come to know him. 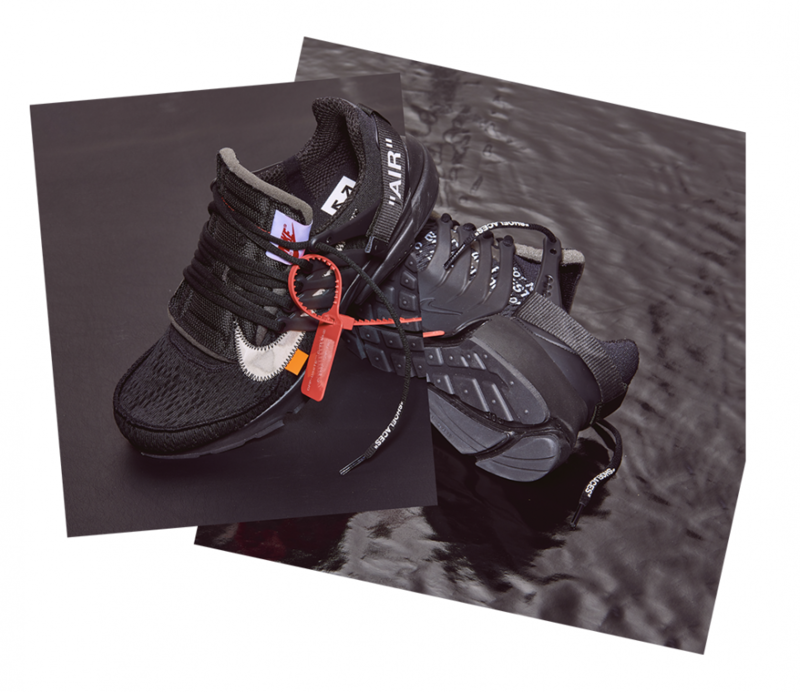 Nike X Off white “The Ten” collection created major buzz when it first arrived in late 2017 and has sustained a pretty impressive rank with every pair that followed. The Nike x Off white collaboration was the biggest thing that happened to the industry, ever since Nike signed Michael Jordan, and Adidas joined forces with Kanye. 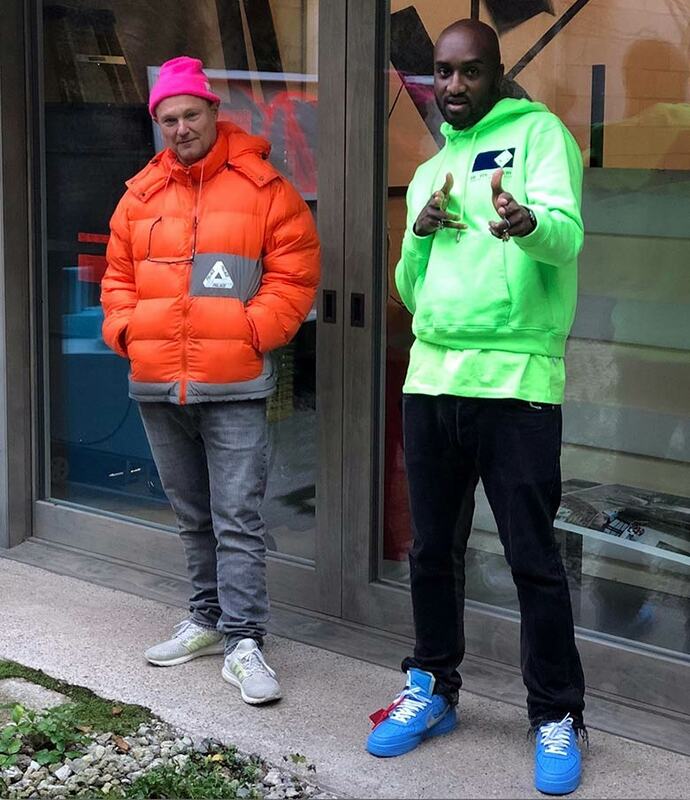 This partnership has brought so much style, uniqueness to the industry and contributed to a big portion of the sneakers aftermarket value. Why Nike X Off white is a Big Deal? The Nike x Off white collaboration got the attention it got for so many reasons. It was a combination of good timing, convenient opportunity, and great business and marketing strategies. Let’s not fool ourselves now, we all know that a big percentage of players in this sneaker game are resellers. Flipping for cash is why most of us are here. We also know that scarcity draws in the biggest bucks. From that first pair, Nike Off whites were clearly going to be the new hard-to-cop kicks. And this remained the case for as long as the collaboration lasted. So, resellers saw the golden opportunity in this and they all reached out and grab it. Well, at least they tried! Another factor to add to the hype was the difficulty of copping. When the first pairs of this partnership saw the light, the assistance of a sneaker bot was not an option. You had to go through the whole SNKRS raffle process, fair and square. This explains the inflated resale prices of the first 10 pairs. It took a couple of releases until bot makers got it all figured out. And they figured it out so well copping with a bot became the only way to get a pair of Nike off whites. Around the time “The Ten” collection dropped, the Adidas Yeezy line was dropping its last “Really Hyped” pairs. So by the time Yeezys weren’t it, there was a gap which needed to be filled in the industry. Talk about perfect timing for Off white as a brand which was experiencing a peak in the world of fashion. The increased stock of Yeezys set sneakerheads on the lookout for new coppable sneakers. And they found what they’re looking for in Nikes new Off white line. Add to all the above-mentioned reasons, the fact that Virgil had a more eccentric and fashion-forward style. Something that the industry needed desperately. Virgil Abloh and Nike’s “The Ten” collaboration was the biggest sneaker event of 2017. And this great success led to the extension of the collaboration all the way to February 2019. so, what was initially a 10-sneakers collection, became a long-term relationship delivering over 30 pairs of exclusive and very hyped kicks. Nike x Off white’s original collection, “The Ten” dropped in 2 packs of five in October and November 2017. And as with the rest of the releases, Nike, Jordan, and even Converse shoes were featured throughout the lifetime of this partnership. The first batch contained the Off-white Nike Air Jordan 1 Chicago, Air Presto, Air Max 90, Nike Air VaporMax, and Blazer Mid. While the second batch included Off-white Nike Air Max 97, React Hyperdunk, AF1, and Zoom Vaporfly. In addition, a Converse Chuck Taylor All Star pair was also supposed to drop on that second phase, but for manufacturing reasons, it was pushed back to early 2018. With these 2 batches, it felt like Nike was testing the waters, and how well the industry will take this new collaboration. Well, it was clearly welcomed with open arms. So, building on the success of the first 2 packs, Nike along with Off-white dropped over 15 pairs throughout 2018. Each featuring Off-white’s signature bold lettering, “Quotes”, and zip tie. As this is a matter of personal taste, we did not rank the Nike X Off White sneakers. Below, you’ll find all the collaboration’s released sneakers, sorted in chronological order. You may or may not like Virgil’s work, but you gotta admit that the resale value is very very impressive. Especially that of the first 10 pairs. Hard luck if you missed out then! 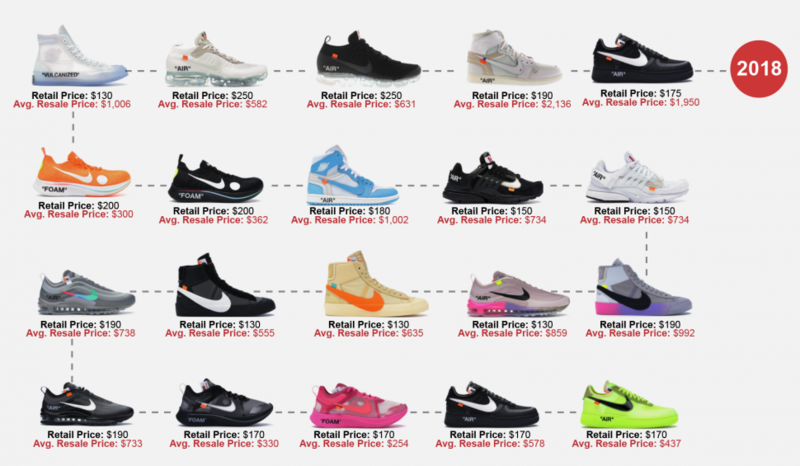 There’s no doubt that the resale prices of the Off white Nikes fluctuated at times. Not every silhouette featured was to-die-for. But any value lost on the Zoomflys, for example, was made up for with more celebrated silhouettes such as the Air Jordan 1. And it’s understandable, flooding the market with Yeezys, for example, led to their resale sinking to its lowest value ever. Although this was not as dramatic with Off white Nikes, but resale prices did drop. The collaboration ended with the release of 2 iterations of the AirMax, Desert Ore and Black, which in comparison with their retail price are doing pretty well on the aftermarket now. Will there be more off white Nikes? Although Virgil did announce the end of “The Ten” collection, he did say that his partnership with Nike is not over yet. This sounded more real when pictures of him in an all-new pair of Blue Air Force 1 surfaced. This pair is said to release sometime in June 2019. And with nothing else to look forward to in the foreseeable future, we’re really hoping this Blue pair becomes a reality. What’s Virgil been up to? Now that he’s kinda on a break with Nike, what’s Virgil been up to? Well, the creator of the infamous, and highly-desired yellow industrial belt, has been quite busy. Aside from releasing his new collection as the men’s artistic director at Louis Vuitton, and working on his second. Furthermore, Virgil just finished working on a collaboration with Ikea. This collection will include rugs, Pillows, a table with chairs, a mirror and an Off-white version of the Monalisa. And of course, it wouldn’t really be Virgil’s work without the big bold words in quotes such as “Wet Grass”, “Keep off”, and “Sculpture”. As per Ikea, this collection will release in November 2019. Check the full price list here. Now that this chapter being over, what’s gonna be the next big partnership in the industry? Will Yeezys climb up the hype ladder again? Should we wait for another big partnership to emerge? It’s an ongoing competition, scoring the biggest partnerships and making the biggest buck. So, what are some of the biggest collabs in the industry now? In addition to Kanye, Kylie, and Kendall Jenner working with Adidas, Cardi B recently joined Reebok, and Selena Gomez is with Puma. We have these collabs set up already. But the new partnership that has the whole industry talking, is that of Adidas and Beyoncé. And while we wait for more information on that partnership, behold the highly-coveted Travis Scott’s X Air Jordan 1, releasing May 3rd, 2019, and its insane early listings. No question you’ll need a very powerful bot that day!